President Donald Trump has made it more than clear that he thinks the liberal media — or “fake news” — is out to get him. And his son echoed that sentiment following a tweet NBC sent out during the 2018 Golden Globes. After host Seth Meyers made a joke about Oprah Winfrey becoming president in his monologue, NBC tweeted what appeared to be an endorsement for the former host of The Oprah Winfrey Show. 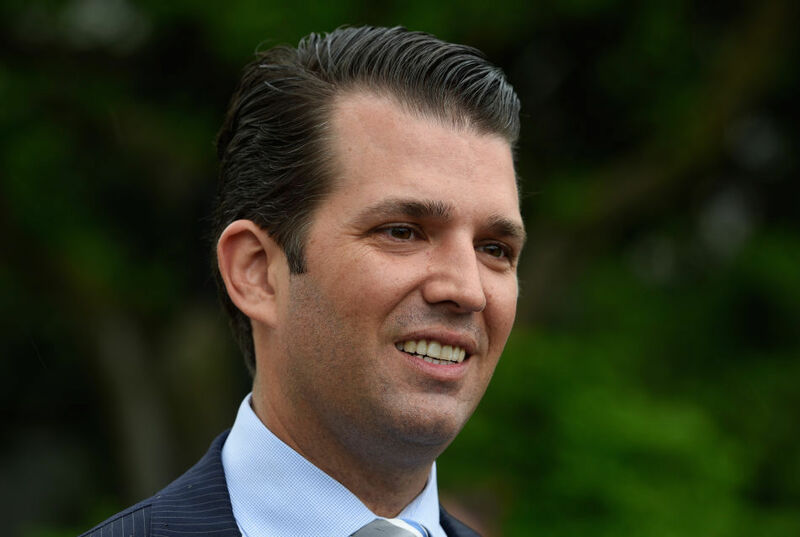 Donald Trump Jr. then took to Twitter to call out the television network for its “obvious” “bias” against his father. "Nothing but respect for OUR future president. #GoldenGlobes"
"In case anyone had any doubts about where the media stands this should take care of it. The bias against @realDonaldTrump is now so obvious they have simply given up hiding it. Can you trust anything they say at this point? Americans see the truth in job #s & in their wallets!" Once he saw that the NBC tweet no longer existed, Trump Jr. shared a screenshot of it — because nothing is ever truly deleted from the internet. NBC released a statement on Twitter about how the tweet was sent out by a “third party agency” and wasn’t “meant to be a political statement,” which is the reason it has been deleted. Although you could interpret the tweet to mean that Oprah was becoming the president of NBC, it was most likely playing off the meme “Nothing but respect for MY president.” The meme started when a Twitter user posted those words after cleaning up Trump’s Hollywood Walk of Fame star, which has been defaced multiple times since he became president. People responded by citing other celebrities were THEIR presidents. The controversial tweet from NBC came after Meyers joked in his monologue about comments he made at the 2011 White House Correspondents’ Dinner, when he discussed Donald Trump running for president. Meyers said: “Donald Trump has been saying that he will run for President as a Republican, which is surprising since I just assumed he was running as a joke.” And “Gary Busey said recently that Donald Trump would make a great President. Of course, he said the same thing about an old rusty birdcage he found.” And “Mr. Trump may not be a good choice for president, but he would definitely make a great press secretary. How much fun would that be?” before launching into an impression of Trump calling Kim Jong-il a “loser.” In retrospect, the last bit was strangely prescient. You can watch Meyers target Trump at the White House Correspondents’ Dinner around the 12-minute mark in the below video. At the Golden Globes, Meyers tried the same tactic with Oprah, who was the recipient of the Cecil B. DeMille award. “Oprah, you will never be president. You do not have what it takes,” he said. It was a hilarious moment at the top of the show, since Oprah and Hanks are beloved by literally everyone. But NBC’s jokey tweet has had serious repercussions since it appeared, and Republicans like Trump Jr. did not let the moment go unnoticed. Even people who don’t lean right thought it wasn’t a great move by NBC. Although you may agree with NBC’s deleted tweet about Oprah for president, you can see why this type of tweet shouldn’t necessarily have come from a news source. But hey, if Oprah is elected as president in 2020, then NBC can tweet all it wants about Oprah being America’s president (and about the prediction it made a few Globes ago).